Ralphie rocked from foot to foot and sucked air in between his teeth. The blond boy straightened, eyebrows raised high. He yanked tatty pockets out of his grimy chinos, face pinched death white. Stevie snickered and boogied a rain dance. The word limit for Marble is 100 words. I used all 100. Categories: age, friends, lifestyle | Tags: Flash in the Pan, luck, marble, The M3 Blog, waste | Permalink. He better give him the ten commons!!!! ‘Boogied a rain dance’ is a fab phrase! When we were kids sometimes we’d do what we called (native) Indian dance (from the movies) but I didn’t want to stereotype. Great descriptions, “sucked air in between his teeth” “fat cheeks…Elfin ears…” Really good writing Tess. 🙂 And, clever use of marbles to set the scene. Thanks, Paulette. You are most kind. My husband has a big tub of marbles from his kid days. He let the kids play with and lose a lot, but he still got the good ones. The competition and ‘gambling’ that marbles were responsible for, as well as tears and joy for the winners–that was a time! I suppose marbles don’t sound interesting enough what with all the cool ‘modern’ stuff available. My Dad used to talk about playing marbles as a kid. I had forgotten all about that. Wonderful writing! It’s amazing how vivid some of those childhood memories can be! Kids are so mean! It’s nice when they learn to keep it inside. That brought back memories – thanks! Great story and use of phrase and descriptions. I am glad my Brother won’t (I hope) read this or he will start again even though it was decades ago. “Remember the time you lost my cat’s eye…blah blah blah. Well Bro, didn’t lose it, even worse, gave it away as I didn’t know its value…oops. Mum’s skirts came in handy for some time (me running and hiding behind them). poor Ralphie needs a big hug! I hope that’s a good thing. I can’t recall when marbles went out of fashion. great story and well written! Enjoyed the read. I was never any good at marbles, Tess. I always lost mine. Never had any to swap. Good job really, as I’d have only lost those as well! Great story! Thanks, Tom. Hope it reminded you of younger days. I think we had a LOT more fun than kids do now, in so many ways. As Michelle Obama said during the fitness incentive that she led in the US, Let’s Move (I think the name was, maybe still ongoing) anyhoo…when we were kids we were outside for hours at a time, running,skipping, playing all kinds of games. We had to be literally dragged in at the end of the day, by mom calling on the back porch. I read her words and I nodded and smiled…yes, that’s how I remember growing up too. Now, it seems that waaaay too many kids are glued to their computers and TV’s getting fatter, sicker…it’s so sad and so unnecessary too. I applaud the First Lady’s work on this campaign. I hope it has continued. I agree with you. My young days were spent outside too but after I did chores and we ran and skipped and played baseball and chased each other and shoveled snow. Today, I’m sad to say my six and ten-year-old grand kids are too busy to answer me because they are plugged into an iPad and a tablet. I don’t understand the Flash in the Pan thing, but you did a great job with the story. Like the marble photo. I was a wicked marble player when I was a kid. Not sure of ‘in the pan’ but I suppose it means a quick jump in and then out cause the pan is hot which makes the story short? Ahhhh. that makes a lot of sense. In and out – cat on a hot tin roof. I think flash in the pan though does come from the old days of photography where they used flash powder, in a “pan” – more like a trowel looking thing, to create a flash of light for dark scenes. It was very quick – the powder would be lit, it would ignite and flash – flash in the pan. I really have no idea why they stopped it. I lost at marbles. A lot! loved this, brought back so many memories! i just recently bought a batch of marbles, couldn’t find them anywhere, had to make an afternoon out of trying to find them! They still sell marbles? Wonderful. What will you do with your marbles? Good for you! I think that’s marvelous. tell me about it! it’s a challenge to pry them away… ohhh such a challenge! You nailed it again, Tess. Brought back so many memories. I remember putting marbles into the oven just long to get them to crack from the inside out, but not break. They looked very cool that way! Sherri, you have made my YEAR. You are a most generous blogger. Thank you. You’re damn good yourself! Who knew the word ‘marble’ would stir up such great conversation? Tess: Being a rancher’s daughter, none of my brothers played marbles and consequently I didn’t know how to play either. We lived 60 miles from nowhere and certainly that far from concrete or pavement. 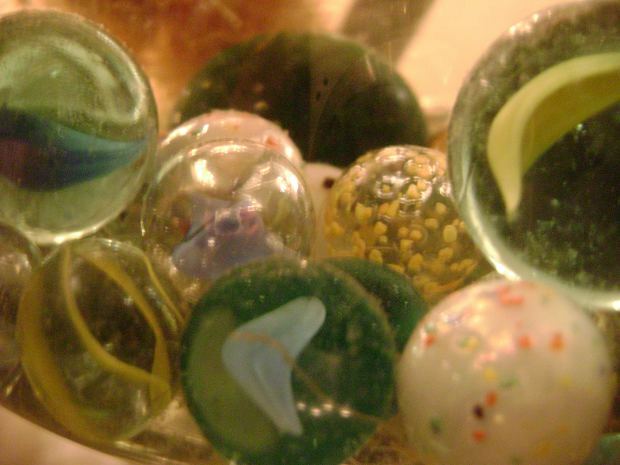 It wasn’t until I met Tom that I understood the value of certain marbles. His champions, as he calls them, have a special nest along with his grandfather’s railroad gold watch and a few other mementos. I love this story, Sheri, that grown up boys still value such things as marbles on the same par as a grandfather’s watch. But I do remember the marble-hoarding days.